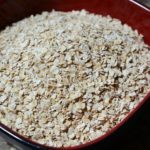 In a large bowl, whisk together all ingredients, except the oats. Fold in oats and combine well. Transfer mixture into the buttered baking dish and spread evenly around. Cover tightly with plastic wrap, pressing the plastic directly on top of the oat mixture. Refrigerate overnight. In the morning, preheat oven to 375°F. Unwrap oatmeal and place in oven. Bake for about 30 minutes until oatmeal is set and browned on top.